"The Lord has innumerable forms and names, and devotees may meditate upon a particular form and chant the holy name according to his attraction. The best course is to hear of the holy name, form and so on from a pure devotee of the same standard as oneself. In other words, one who is attached to Krsna should chant and hear from other pure devotees who are also attached to Lord Krsna. The same principle applies for devotees attracted by Lord Rama, Lord Nrsimha and other forms of the Lord. Because Krsna is the ultimate form of the Lord (krsnas tu bhagavan svayam), it is best to hear about Lord Krsna's name, form and pastimes from a realized devotee who is particularly attracted by the form of Lord Krsna. In Srimad-Bhagavatam, great devotees like Sukadeva Gosvami have specifically described Lord Krsna's holy name, form and qualities. Unless one hears about the holy name, form and qualities of the Lord, one cannot clearly understand the other processes of devotional service. Therefore Sri Caitanya Mahaprabhu recommends that one chant the holy name of Krsna. param vijayate sri-krsna-sankirtanam. If one is fortunate enough to hear from the mouth of realized devotees, he is very easily successful on the path of devotional service. Therefore hearing of the holy name, form and qualities of the Lord is essential." While hearing is the first process in developing Krishna consciousness, chanting the Hare Krishna mantra is the second. This mantra consists of the holy names which, unlike ordinary words, when uttered place one into immediate contact with God. By repeated, attentive chanting of these names, a person cleanses his or her mind and develops spiritual consciousness, as well as transcendental bliss. The Transcendental Chanting Machine below can assist you in chanting Hare Krishna. Just read along as the names of the Lord appear in the window. The speed of the chanting is adjustable. Above is beautiful Krishna. 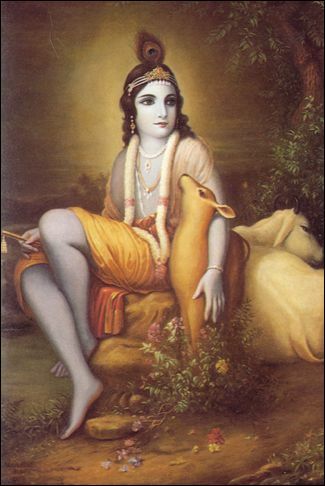 Although He is the Supreme Personality of Godhead, He enjoys pastimes as a cowherd boy in rustic Vrndavan. "Always think of Me, become My devotee, worship Me and offer your homage unto Me. Thus you will come to Me without fail. I promise you this because you are My very dear friend." The text below changes whenever this page is refreshed. Gita Quotes: Click to View or Add Text.